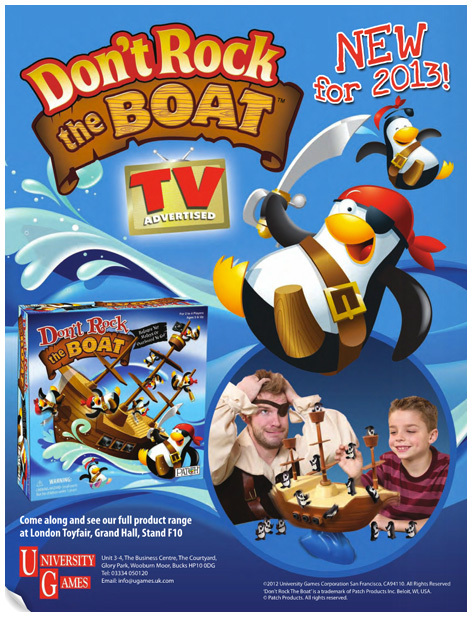 Don’t Rock The Boat is an exciting balancing game for 2-4 players aged 5 years and over. Designed and produced by University Games, it features a pirate ship that is carefully mounted on a special rocking base. A good supply of pirate-dressed penguins provide the ballast that can so easily tip the boat over to end the game. By using dexterity and an element of careful logical thinking, children can easily outwit their opponents and end up the winner. Don’t Rock The Boat is also a great game for all the family to play, and like similar balancing games such as Who Shook Captain Hook, great fun and hilarity comes in large doses. Please tell us what you think of Don't Rock The Boat by University Games. We played this at the Chicago Toy and Game Fair with kids from 5 - 25 years old and everyone loved it! Challenging to start with but you quickly learn how to upset your fellow pirates. It is really nicely designed and the pirate penguins are cute.